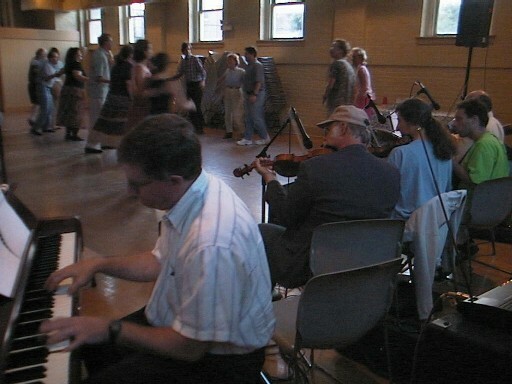 Played piano at the local Contra dance on Friday night, but not all the time. I shared the piano-playing with the guy pictured above. Nice guy, excellent musician. On Saturday afternoon, laughed like a crazed mofo at the movie Bruce Almighty. It is hilarious; you should see it. On Saturday night, I took Bethany to a Contra dance in Berea, her first Contra dance ever. Many of my regular Berea dance partners were not there. Care for a hambo, Danielle B? Guess not; too bad. Breathed a big sigh of relief that I made it through both dances without being murdered. Sometimes Neo avoids Agent Smith, and sometimes Agent Smith avoids Neo. On Sunday, watched the Pride and Prejudice DVDs with Bethany, just to get it out of the way. It had to happen sometime, and now I can stop it from ever happening again. Didn't do anything exciting at all today, a government holiday, because everyone knows I have no life.